Oh dear, sweet, Fireman……what I can say? How does one summarize in a few words, what the past 12 years, 5 months and 24 days have meant to me about my life with you? You were the absolute best dog. You were my buddy always and we shared so much life together both at home, in the show ring and in the field. You are the single most reason why Amethyst dogs are what they are today. From the breedings to Storm (MacAlder J’Amethyst Royale) and to Asti (BIS Puppy Ch. Clansmen ‘n’ Amethyst Hi Ground) you have laid the foundation for Amethyst Gordon Setters for many, many generations to come. Since March of 2007, I was so privileged to have had 4 living generations at Amethyst. You were the great-grandfather patriarch to your daughter, Ice (Trial by Fire o’ Amethyst, CGC) and her daughter, Twister (out of Am/Can/Mex Ch. MacAlder Best For Shojin) and then Twister’s son, Drifter, out of Marte’s Ch. Glen Oak’s River Breeze Shiraz. What was even more fun, was that your half-sister, Kate (Ch. Glen Oak’s African Queen, JH), was part of 4 generations on Drifter’s other side. 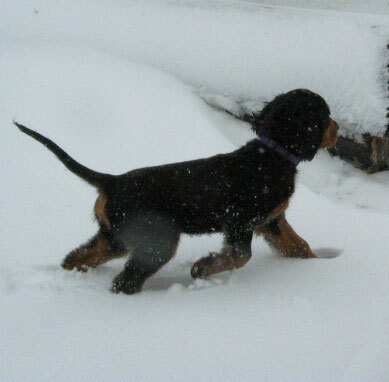 Sadly, your sister, Kate, left on April 17, 2007 which was Drifter’s 3-month birthday. I helped Marte obtain a 4-generation photo but were not able to do so with you Fire. I will always regret that, but you are so much in Drifter and I will see you each and every day in Drifter. I so loved you as a puppy, Fire. I so love the legacy you carried on. Fire as a baby in May 1995. On March 14, 1995, you were born to Glen Oak Gordons and Marte Wetzel’s KC out of Magic. I had always loved the photos of your father, Ch. Black Anvil Kadabra (Magic) that I saw in the Gordon Quarterly and the GSCA News. In the middle of May, Marte had the litter evaluated and as the Green Collar Boy you were #1 puppy. What a totally handsome boy you were….not overdone…gorgeous headpiece and a nice square body. 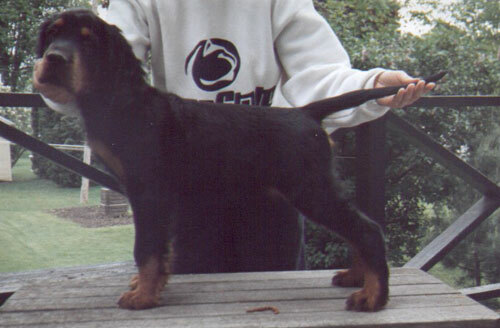 You were an anniversary/birthday present to me from Greg in 1995…..you got to show in your first show at the 1995 GSCA National out in Pennsylvania……as a 6 month and 5-day old puppy. You were from Glen Oaks' the “Dance Theme” litter. Since I had decided that your name was going to be Fire, I chose a selection from a New Age recording pianist, David Lanz, entitled Firedance. Greg DaValt has performed and recorded this piece for me, for this memorial for you. Greg spent many years with Fire, too, and loved him as well. This song is just a perfect for him and his memorial. Greg has several of Fire's offspring that live with him and Donna DaValt in Oklahoma. I so loved you, Fire. You loved birds. Phil Wachuta, Tartana, told me that you were “birdy” at a Badgerland Gordon Setter Club Fun Field Day. Phil was impressed that Fire came back to me when I called him. So, in May of 1998, I entered you in a couple hunt tests. The first day, you earned the first leg of your JH title. Me? I was off bawling because I couldn’t find you. Greg had given me a whistle, but of course, you really weren’t whistle trained. The judges, Sharon and Ron Fitzpatrick, saw you off in the woods pointing a grouse. I quickly dried my eyes before they came up to me on horseback and I said, “I can’t see him.” Ron and Sharon said, ”but we can. Please shoot your blank pistol and harness him up.” Bumbling like Barney Fife on the Andy Griffith Show, I found my pistol and shot it off, and then you came over to me. We had our first JH leg…and I was so proud of you. The next day, wasn’t so lucky. I tore my ACL because I lost my cool at something that happened with you and another dog. Suffice to say, I learned my lesson, about losing my cool, but I never took you back to the field. Your children and grandchildren have accomplished wonderful things in the field thanks to your natural bird abilities. I so loved watching you in the field and watching your son, MacE as he earned his Master Hunter title. I so loved watching Coal earn his Junior Hunter title and love watching Drifter train for his Junior Hunter title. Your son, MacE with a few birds. 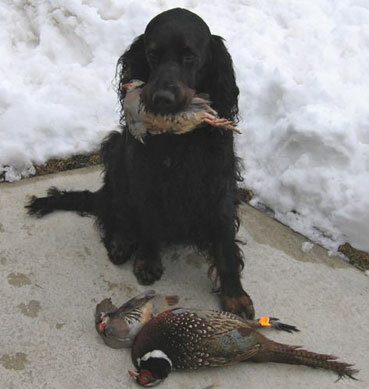 He earned his Master Hunter title in 2007. 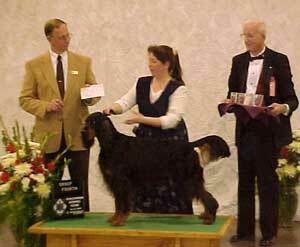 He is owned and trained by Ron and Gwen Pfeil, Alainn Gordon Setters. MacE's mom is Asti. Your grandson, Coal, Ch. Amethyst's Black 'n Time, JH who earned his JH in the summer of 2005. He is out of Chipper and Ice. You and your kennelmate, Thunder, were best of buds as young dogs. You would steal points from Thunder from the American-bred class and finished from that class at the May show in Madison, Wisconsin. You both were shown in brace class and did very well winning 1st at the GSCA National in 1997 as well as at several regional specialties in a two-year period. You became a show champion in 1999 and at your first specialty as a special, you made the “cut” to the final 5 male champions. I kept watching Marte outside the ring…..wondering why you were still up in the front of the line….that was such a thrill. 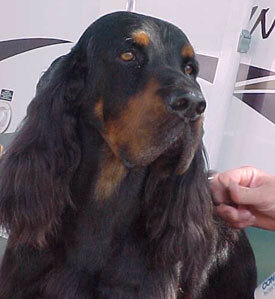 Mr. Chashoudian always liked you…..from a great placement in open dog at a NODROG Specialty to an all-breed show. You were always in his picks. I so loved showing you, Fire. You were the BEST show dog. You stood and stayed for me and always gave me 120% of anything I asked of you. Your son, Ch. 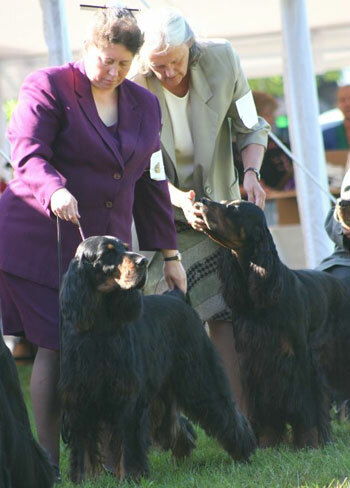 Amethyst’s Sparkling MacEdan, MH, RN, CGC, TDI owned by Ron and Gwen Pfeil, Alainn Gordon Setters, has done you proud, Fire. His birdiness was a fine tribute to you and Asti (his mom). He was the first Master Hunter title holder for you and for Amethyst. Truly a “feather” in your stud dog contribution to my lines. Just two weeks ago Ron brought out a bird….and you pointed it….and looked so very excited about the fun you were having. Dear friends, Marte Wetzel and Beth Hintz, who were with me in Des Moines, Iowa on Friday and Saturday, packed up the van and drove me home to be with Fire. Ron and Gwen were so very kind to run to the house on Saturday when I was still on my way home from Iowa. Sadly, you had already departed to the Bridge before they got there. My intentions that day were the best for you Fire. From Laurie Carlson’s caring ways and telling me to get home, to the watchful eye of Luther and Sandy Pohl, you were cared for. I prayed for you to pass quickly when I knew what was happening…and my prayers were answered. I did not want you to wait for me. In time, buddy, we will meet again. On Sunday, September 9, 2007, Gail Godding (Willowglen), Beth Hintz, and Marte Wetzel (Glen Oak) came over and we celebrated your life and times. Beth, Marte and I reflected all the way back from Iowa and continued our celebration of your life on Sunday morning. Marte brought over some green rickrack to put on your neck and I grabbed your 2006 Veteran Medallion from last year’s GSCA Veterans’ Sweepstakes competition. Judge Lorraine Bisso awarded you 3rd place in a very tough Veteran Dog class. At the age of 11 + years, you showed your heart and soul out for me. It was a moment I will cherish for the rest of my life. Denise Sweeney, Windcrest Setters, captured us in the ring, together, and I share that photo here. Ch. Glen Oaks' Firedance o' Amethyst (Fire) and Peggy DaValt at the 2006 GSCA National Specialty in Cleveland, Ohio. Photo by Denise Sweeney. Beth, Gail, Marte and I toasted to you using the glasses you won from your Group 4 placement in 2000 and Aussie wine to celebrate your great-grandson’s heritage. You were my first Group placing dog. Ch. 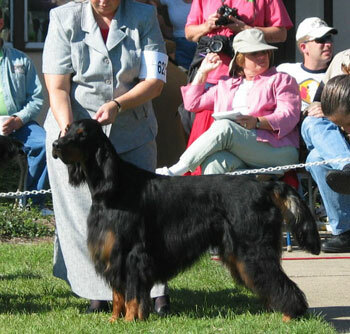 Glen Oaks' Firedance o' Amethyst - shown earning a Group 4 from Judge Tom Fennis at the Wisconsin Kennel Club Show in January 2000. I so loved showing you at GSCA Specialties, Fire. You came, oh so close, to qualifying that year for the inaugural Eukanuba/AKC Classic in 2000. You missed it by a couple breed points. Greg DaValt and I put many miles on the RV that year in pursuit of that invitation. But in 2005, your grandson, Ch. Amethyst’s Black ‘n Time, JH (Coal) who is out of Am/Can/Mex Ch. MacAlder Best For Shojin (Chipper), qualified and he and I made the trip to Florida in January 2006. Coal so looked like you and while it would have been fun to go with you, your legacy lived on in your grandson. 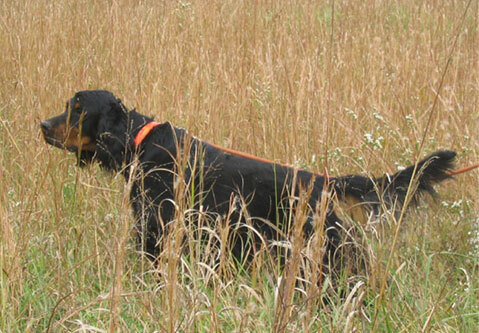 Coal has an incredible hunting drive and has a nose that makes his owner, Bob Bertram, so happy. Thank you, Firedog, for that gift you hand down to your puppies and grandpuppies and great-grandpuppies. Fire in New York - Wine Country Circuit - 2000. 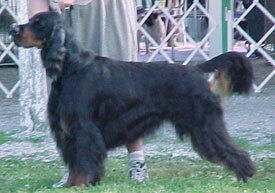 Coal at the 2005 GSCA National Specialty. I could go on about you forever, Fire. You were the best Gordon Setter a breeder could have hoped for. My friendship with Marte Wetzel grew and developed over the years because of you. Our similar philosophies on Gordon Setters and our love of this fine breed have forged a friendship that I treasure each and everyday. I have met so many fine people because of you, Fire. I have learned so much about life because of you. I am a better person because I have known and loved you, Fire. To all of the people whose lives you have touched……and who helped me while I was in Iowa….you are the best…..Marte Wetzel, Beth Hintz, Gail Godding, Laurie Carlson, Deb Ferrell, Luther and Sandy Pohl, Ron and Gwen Pfeil and Greg and Donna DaValt. And….even the barriers of death will not prevent me from loving you, Fire. Sleep warm, my friend. May you watch the fire of the sunrises and sunsets in your final resting place by the barn overlooking the marsh. May you dance at the Bridge with your sisters, Joanna, Jazz, Phoebe and brothers, Gunner and Copper…as well as all of the others that have gone on before you, Spice, Knight, Trouble, Kiggan, Storm, Thunder and Dude, as well as Hank, Kate, KC and Magic. There are so many memories…..such a wonderful life and healthy life. But it’s never enough time. I have Amethyst’s Snow ‘n’ Ice (Drfiter) to carry on in those oh-so-big pawprints. You danced so well while you were here. Thank you for leaving an incredible legacy. Fire….I so loved you and always will. The tears will flow for many days to come. With so much love for a life well-lived, Fire. "Firedance" - Background music written by David Lanz. Arranged and performed by Greg DaValt, DaValt Music.